This week me (Andye), Kit, and the rest of our family are on vacation! We're making our trek to the Holy Land, AKA Harry Potter World. I....er......We have been dying to go here since it opened. And thanks to my amazing parents and a well-timed conference, we're finally able to be here!! We got there as soon as the park (Islands of Adventure) opened and headed straight to HP World. It was already crowded, but there wasn't any wait to get in. The Hogwarts Express conductor greeted us, and we were seriously in awe of how amazing the whole thing looked! After we came into the park, we walked straight into the village of Hogsmeade. It was exactly what I pictured it to be! 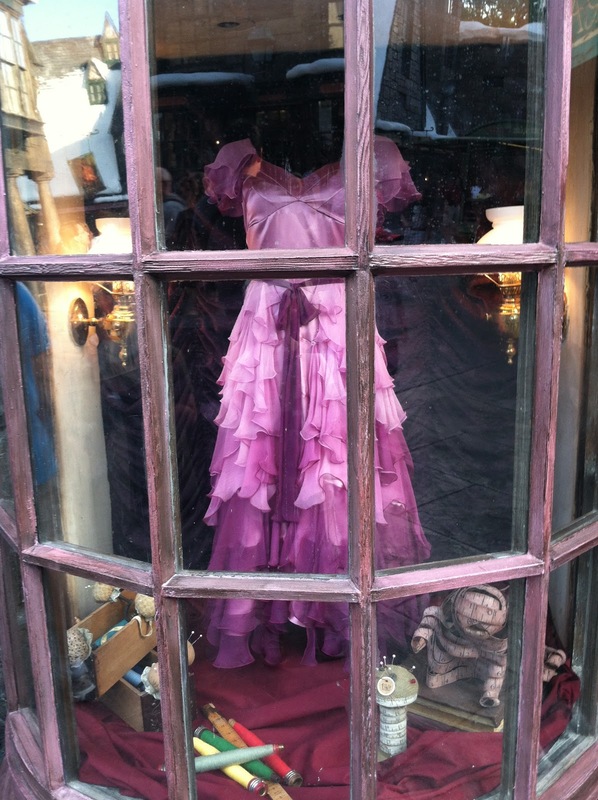 Well, technically not all the stores are in Hogsmeade (like Olivander's, which is in Diagon Alley) but I'm glad they were all there. I do wish Weezleys Wizard Wheezes had been there, but maybe they'll add it when they expand. The first ride we went on was the Dragon Challenge. All along the way, you walk through all the Tri-Wizard tournament decor, to make the line more interesting, though there was actually never much of a line (15 min tops). 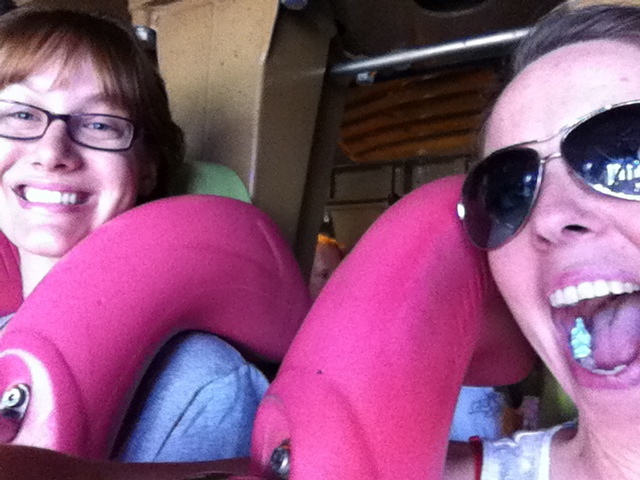 On the Dragon Challenge (with my sister-in-law). Yes, of course there's gum in my mouth! After the ride, we had to get something to drink, so we grabbed some Butterbeer and some yummy pumpkin juice. It tasted like Apple Pie! The students of Durmstrang and Beauxbatons danced for us! We went on the Flight of the Hippogriph, and saw Buckbeak and Hagrid's Hut. then we entered the castle. I took a lot of pictures, but it was pretty dark, so they didn't come out too great. 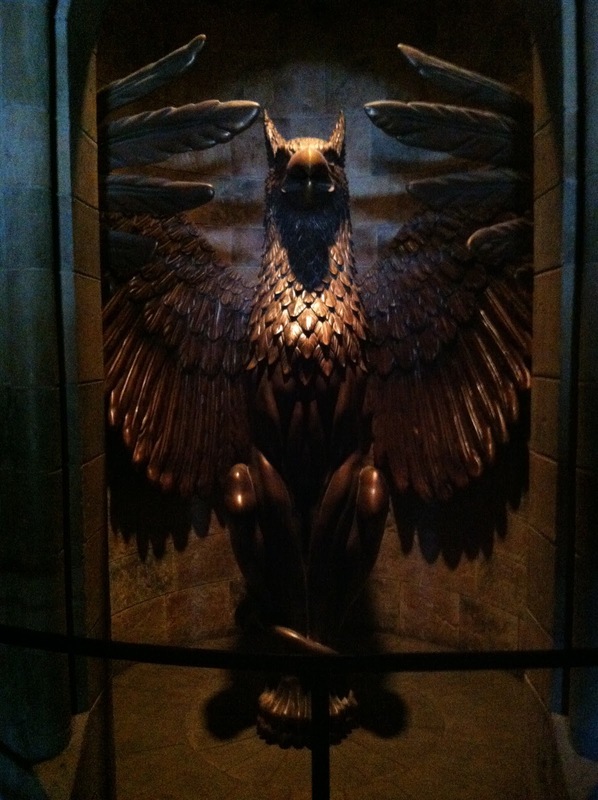 We went through Dumbledore's office, Professor Binns' classroom, corridors with talking portraits, including The Fat Lady, The Common Room, and saw SO MANY amazing things from the books/movies. Then we got on the ride, which was a moving simulator. It was seriously awesome. I can't even tell you how much I loved it! After the ride, we were very hungry, so of course we went to The Three Broomsticks. There's Kit with her mouth full of Turkey leg. After eating we went over to Ollivander's Wand Shop where Reagan (my younger daughter) was selected to pick out a wand. Ollivander did a presentation where she got to try out different wands to see which was a good fit for her. This was fantastic! I swear, she was convinced that she was actually performing spells. It was perfect! Then we all went into the wand shop and the kids got wands! and we saw lots of awesome things like Quidditch supplies, Omnioculars, and The Monster Book of Monsters!! Later that evening, we went back to the castle, and the wait for the ride was so much less. We only had to wait about 20 min before getting on the ride. And look at the Castle at night. So pretty!! The next day, we checked out the rest of Universal Studios, but at the end of the day, we came back to HP world one more time. I have to say, this is the best time to go (Around 6:00). There was no wait for the rides. Even the castle ride line is pretty quick. We rode everything a couple of more times. I just can't tell you how amazing it was. I could seriously go back there and spend another day, just sitting in the middle of Hogsmeade. JEALOUS. We have a trip planned to northern Florida this June--I'm trying to convince my husband this would be worth the time! We had passes to Universal for a year and went to WWoHP so many times. I miss it sooooooooo much! It is definitely a place you can visit again and again and not get tired of! Reading this post brought back memories of my trip to WWoHP. I can't explain the feeling I got when we entered the park. Your description of awe is spot on. :) My daughter was heartbroken when she was 1/2 an inch too short to ride the Dragon Coaster. We also had a very long wait for the Castle ride - but it was definitely worth it. 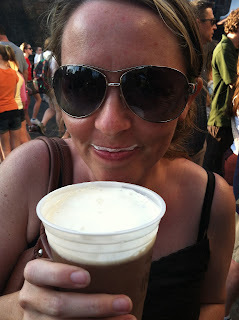 And the butter beer...soooo yummy. Great post!! That looks awesome!!! Thanks for the inside scoop. Ahhh! I HAVE to go!!! My family visited Universal Studios while that section was still being built. It was very secretive and covered so we couldn't see much of it, but the tops of Hogwarts were peeking out. =) Thanks for the inside scoop and the pictures! I can't believe their still that packed :-D I went last Thanksgiving and loved the Butter Beer! BUTTER BEER!! Can you explain how does it taste? Like a real beer or what? So jealous! Looks like you guys had a ton of fun :) I'm hoping to go in the fall. Thanks for sharing your experience with us! Looks absolutely amazing!! I hope to go someday! Seething with jealousy... I'll get there someday! Hopefully! I'm planning on going in September/October-ish once I'm done with grad school and this just made me so excited!! Excellent post. I was checking constantly this blog and I'm impressed! Extremely useful info specially the last part :) I care for such info a lot. I was seeking this certain information for a long time. Thank you and good luck. Hi, There's no doubt that your website could be having browser compatibility problems. When I look at your website in Safari, it looks fine however when opening in Internet Explorer, it has some overlapping issues. I simply wanted to provide you with a quick heads up! Apart from that, wonderful website! It is caused by the sincerness displayed in the article I browsed. And after this post "My Days at The Wizarding World of Harry Potter". you have to post. Could you list the complete urls of your social pages like your Facebook page, twitter feed, or linkedin profile? actually understands what they're discussing on the internet. You actually know how to bring an issue to light and make it important. A lot more people must read this and understand this side of the story. I can't believe you aren't more popular because you most certainly have the gift. Hi there, this weekend is fastidious designed for me, since this occasion i am reading this great educational post here at my home. Whenever I look at your website in Safari, it looks fine however, when opening in IE, it's got some overlapping issues. I merely wanted to give you a quick heads up! Aside from that, excellent blog!